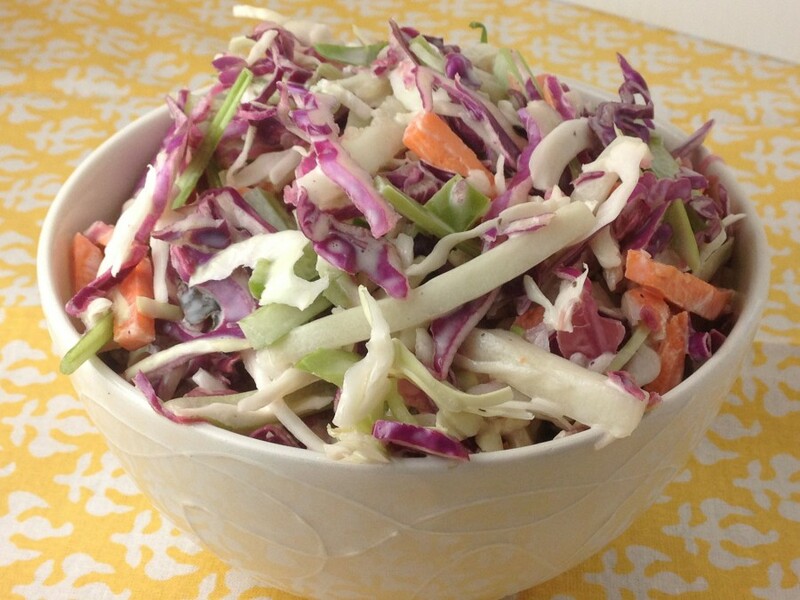 As the quintessential picnic and BBQ salad, coleslaw is member of that famous family of American mayo salads. It often goes unnoticed, flying under the radar, a dull salad that always seems to stick around. Coleslaw remains a popular side but you almost never hear “ooh a side of coleslaw would be perfect with this” or “I’m craving coleslaw with my hamburger.” It’s usually more of a last minute thought, often an impulse buy to a fill that extra space on your plate of BBQ ribs. Needless to say, I wasn’t exactly excited when I came across the my grandmothers unpublished recipe for two-toned coleslaw. I almost skipped right over it. When I started to read the ingredients though, it occurred to me that this was an actual salad and not the sugary bland mush of a slaw I was used to. In addition to the cabbage and carrots, this slaw has freshly sliced cucumber, celery, green bell pepper, and scallion. The contrast between the vegetables made this coleslaw worth a shot. It’s not even necessary to make the mayo for the dressing from scratch (for those of you concerned about eating raw eggs). But it does give it a nice richness that’s worth the extra work. With this old fashioned slaw all dressed up, it finally deserves that prominent salad spot at the picnic table. Combine all vegetables and celery seed in a bowl. Toss to mix thoroughly. In a separate bowl, combine mayonnaise, sugar, and half the vinegar. Taste for seasoning and add remaining vinegar and additional sugar if needed. Pour dressing over cabbage mixture. Mix together thoroughly. Chill for at least an hour before using.